SEVEN Munros to go for the big finish, so it seemed fitting that we started our ascent into the Mamores at 7am. The 'compleation' date for my friend Rebecca has been pencilled in for months, the numbers ticking down steadily in ones and twos. Now it was time to go large. Six big peaks in one long day on one of our finest ridges, all under the auspices of our highest mountain. No matter where you are on this circuit, Big Ben is watching. Our task was the Ring of Steall plus two, the six Munros in the western half of the range. We set off into the trees in warm, misty conditions, moving fast to try to escape the massing midge army that had homed in on our position. Mullach nan Coirean was first. The pull up to the ridge above the treeline always feels like the hardest part of the day. No matter how steadily we climbed, we couldn't shake the midges which had gathered in little clouds around our heads. There was some relief when we reached more open ground, faces blackened with the constant suicide assault which had left thousands of the little devils drowned in a mix of sweat and repellent. 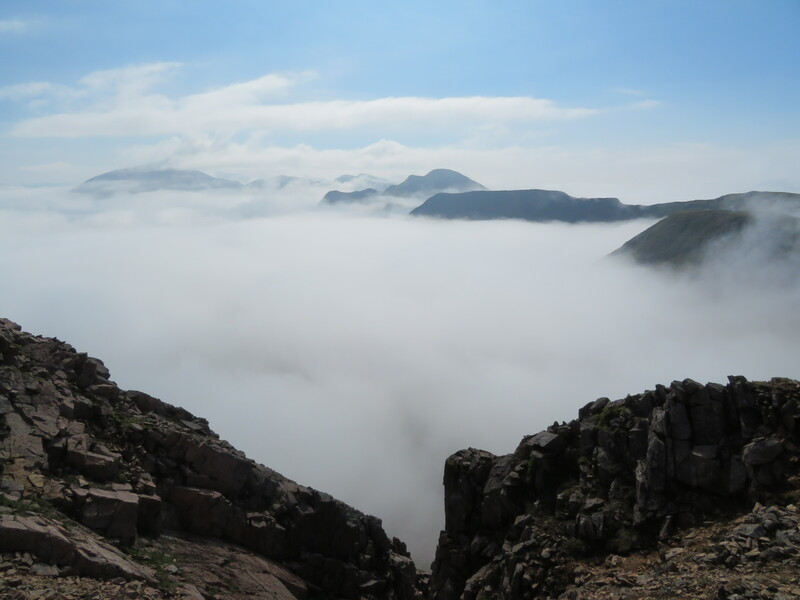 As we made our push to the first summit, we could spot blue sky above the mist. Then the peaks started to appear like black shark's fins cruising through a boiling white ocean. We could pick out every peak on today's tick list, while behind us Ben Nevis rose majestically as if to remind everyone who the real big noise was around here. For Katie this was a revelation; her first Munro day for nearly six years and she was being treated to a sight so rarely seen. The summit of the Mullach was clear but the mist kept teasing us as we continued round, a game of hide and seek decorated in chiffon. 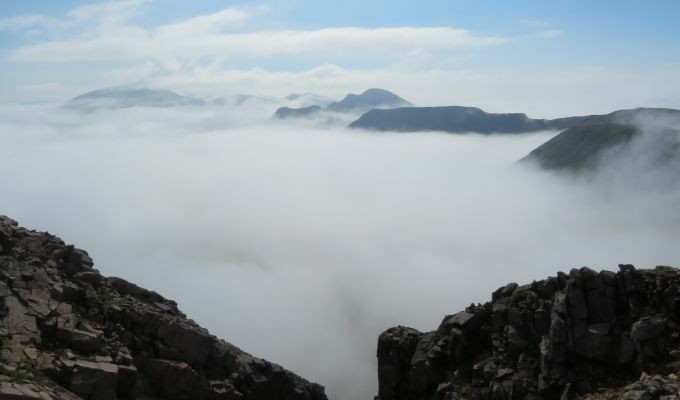 The sleeping Grey Lady of Stob Ban suddenly appeared, a wispy veil around her neck. 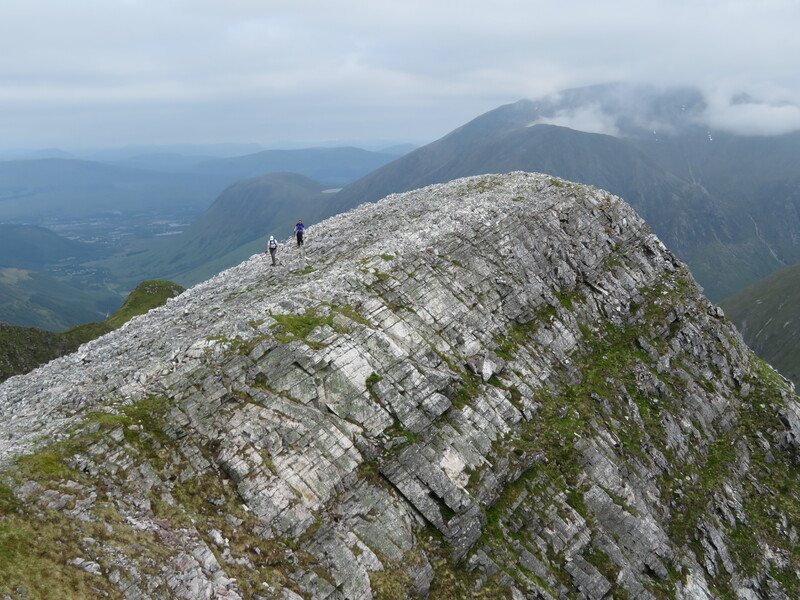 Stob Ban is the best of the collection, and the step change in the rock en route from red granite to white quartzite is sudden and spectacular. The crux of our day lay ahead: a diversion out to Munro No.3, Sgurr a' Mhaim, an in-and-out that would gobble up time and energy on the re-climb. The upside was that it would give us an instant replay of the crossing of the superb Devil's Ridge. Katie left us at the col, delighted she had been able to play a part in this final countdown, then we got our heads down and pushed on. We were there and back in good time, and despite being seven hours down already, we had broken the back of our circuit. From our lunch spot on Sgor an Iuthair, the rest of the route was obvious and encouraging. The mountains seemed to be getting closer together. Poor old Sgor an Iuthair. In 1981 it was re-classified from a Top to Munro status, only for that to be reversed again in 1997. You could argue it either way, but it is hard to ignore being at a major crossroads of the ridge. So far we had met just other person, but here at this busy junction traffic was increasing. There was a couple from Boston, another from the Netherlands. Later we met a trio from Ireland. In fact, we never met another Scot during our 12-plus hours on the ridge. The drop off Am Bodach reminded me why most people choose to the Ring of Steall circuit clockwise. It is steep and loose, and good use of the brakes is needed. Stob Coire a' Chairn is only a kilometre further on but in the now stifling heat it seemed to be running away from us. Another much-needed rest at the top and then there was just one to go, An Gearanach, with only its intervening twin An Garbhanach barring the way. There's some mild scrambling along this rooftop, but in winter it's a more serious proposition than the feted Devil's Ridge. The abundance of crampon scratches are a good clue. Rebecca was able to hold one finger up when she reached the cairn – I'm sure it was indicating how many Munros she had left – and then we began the final drop down in blistering heat. We emerged at Steall Falls, the perfect backdrop for a perfect day, and the shade in the Nevis Gorge path was a godsend. From seven to one in a single day – now bring on the party.